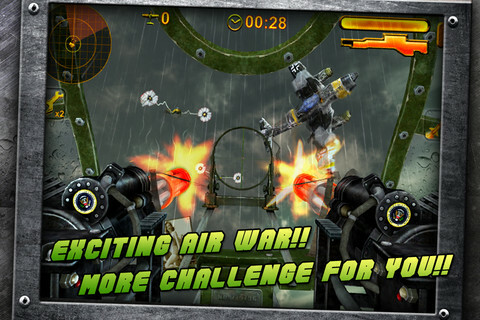 Take to the skies in this aerial war-game adventure. I can't lie. When I first saw the name of this game, knowing nothing else about it, I instantly assumed it was going to be a clone of Commando Jack. Such is the state of mobile gaming in 2012. Fortunately, Turret Commander instead makes a better job than most of providing the thrills of dog-fighting from the perspective of the humble gunnery officer. 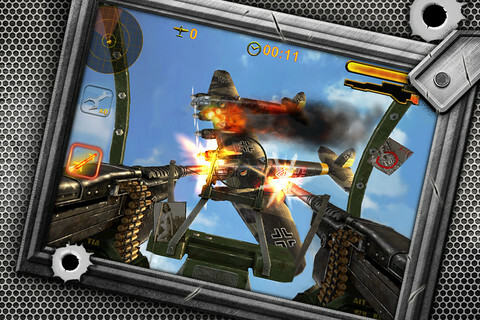 From your first-person perspective you swipe the left side of the screen to steer your targeting view, while holding down the right-hand side to fire your weapon at the invading enemies. The gunfire itself has a satisfying heft to it, and you'll need to take pauses to avoid over-heating. Two other icons offer you the chance to give your plane a quick repair, or fire a sparse number of missiles at more challenging targets. The game's split into two areas of combat: first of all you'll have to succeed at a mission to earn XP that will push you up the ranks a little. Doing so gradually unlocks new missions, as well as the ability to play that mission area in an endless mode, where you battle until your plane takes too much damage and explodes majestically. The radar itself could be better placed to increase awareness of your next pack of approaching targets, and we have to admit we encounted a few oddities with the targeting, where shots sometimes seemed more accurate, the further away the enemy fighter. This only happened occasionally, and never ruined an attempt entirely, but it's jarring nevertheless. In the war-room area, you can spend the cash earned through fighting on upgrading your weapons and defenses. Your turret gun can be made to shooter faster, more powerfully, and with better cooling so it doesn't over-heat so easily. If you prefer to pack a more powerful missile, you can up the number available in any one mission, and also reduce the reload time. Fun though the game is, there's just a little too much repetition between the missions, with the most marked variety appearing in a cloudy scenario where enemies are a little harder to spot and take down. There's also a space-based fantasy zone to eventually unlock. Otherwise, it's simply a case of prioritizing targets and blasting away. 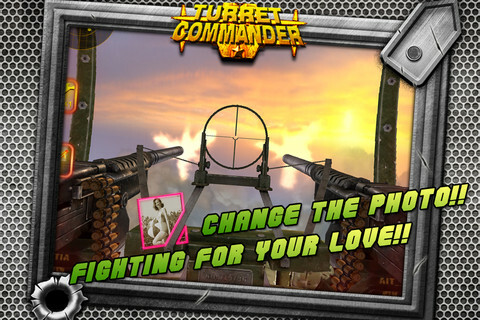 Turret Commander may not quite possess the gripping grimness of, say, Zombie Gunship but it is a enjoyably throwaway arcade experience that should satisfy any shooter fan looking for a slightly different mobile blaster. What's Hot: A great-looking dog-fighting arcade game, with some hefty firepower and plenty of upgrades. What's Not: Occasionally wayward targeting, and a lack of variety in the bulk of the game.